"You created a distributed AI replica of yourself and projected it into the network to run for you!?" 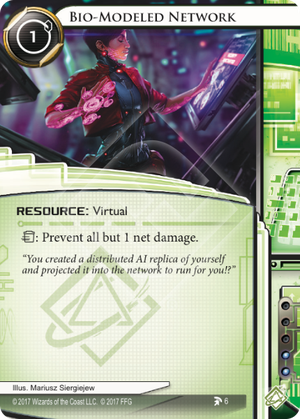 Can the Runner prevent all of the first instance of net damage in a turn using both Net Shield and Bio-Modeled Network? Yes. The Runner can trash Bio-Modeled Network, preventing all but the first damage, then pay 1 using Net Shield to prevent that damage. Why does this card feel bad? Why does this card feel like it was printed in the wrong era of Netrunner? We might be forgiven for thinking that relatively cheap card that can be slapped down for protection against 24 cards seems like a good sell. But then we get to the point about the meta. I don't understand why this card was printed, when the closest thing the meta has seen to viable and 'good' net damage-based decks are Potential Unleashed, and Personal Evolution. Both of these decks thrive on the ability to deal dozens of instances of 1 net damage. The meta is also relevant in this discussion due to the playability of that pool of 24 cards. A good handful see use, a good handful are binder fodder. But this card is dead weight in your deck unless you're expecting to see them. It's pure and simple, a meta call. If you're particularly scared of seeing Project Junebug Psychic Field, Cortex Lock, and Thoth (if you're tag-me) then consider this card. It very well might just carve a niche for itself if corps feel like nuking you in the difficult to engineer scenario where they can reliably deal 3+ net damage to you. In the meantime, Net Shield is probably going to be the better option. I have to disagree with the other review. There is only one thing that matters in this game and that is winning. That is followed closely by not loosing. This card must read: Trash to not loose the game right here right now to net damage.